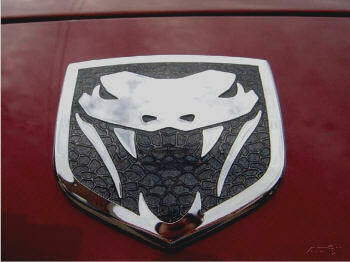 Brand NEW from the Factory front hood metal Viper Head Logo shield emblem. Very difficult to find. Be sure to specify your color when ordering. Simply peel off the back red film and stick for a permanent bond. Emblem measures 2 3/4 inches in length by 2 7/8 inches wide. 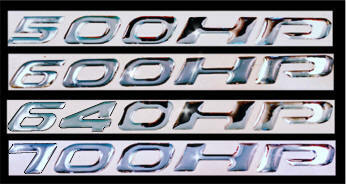 High Polished Stainless Steel emblems to replace your factory plastic emblems on your back bumper. These will never rust, corrode or ever lose their luster. 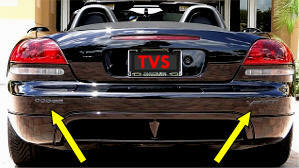 Remove your factory plastic emblems with our easy to use tool - included. 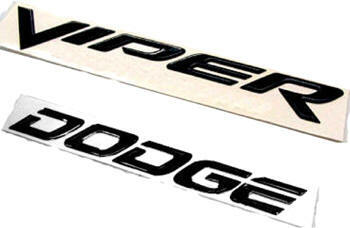 Includes one "VIPER" and one "DODGE" letter set. SIZE: Approx. size of stock Bumper logo. 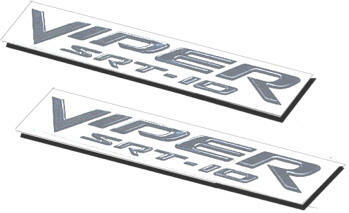 High Polished Stainless Steel emblems to replace your factory plastic emblems on your right and left fender. These will never rust, corrode or ever lose their luster. 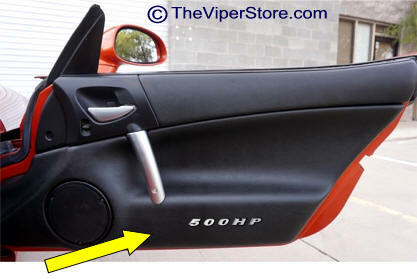 Includes two (2) "VIPER SRT-10" one one each for the right and left fender. 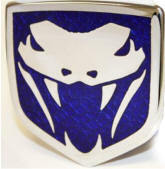 Included are two factory emblems. 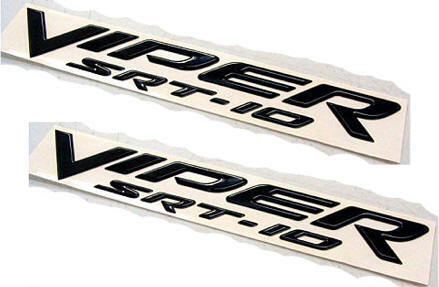 You get Two "VIPER SRT10" emblems in Black. Easy self stick mounting. 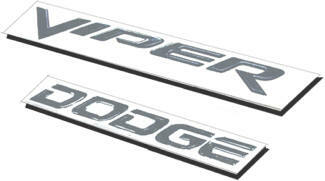 You get both of these fender stock emblems (one for each side). Chrome vinyl letters indicating Horse Power for your vehicle. 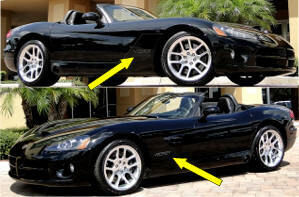 Chose one 500HP, 550HP, 600HP, or 640HP. Size: 1/2" x 5 3/4"
Mount it INSIDE or OUTSIDE - Anywhere! 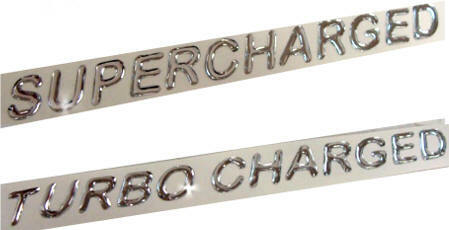 3-D Raised Chrome vinyl letters indicating "TURBOCHARGED" or "SUPERCHARGED". Or choose "Special Edition". Chrome raised Plastic letters indicating Horse Power for your vehicle. 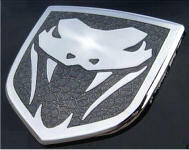 Item is for one emblem - Chose from 500HP to 700HP if you have performance modifications like a full exhaust system. 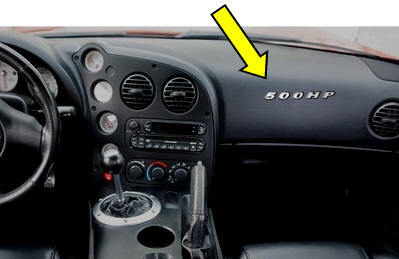 (For custom emblem - simply call us 352 688 8160.) Mount it INSIDE or OUTSIDE - Anywhere!